I know I say this every season, but I love this time of year. The cooler, crisp air, sunny days (sometimes), and the abundance of Fall vegetables and fruits. Apples are my favourite fruit and they are finally in season. Adam, who literally eats anything, is ridicuously picky when it comes to apples, and will actually throw away an apple if it is at all soft when he bites into it. 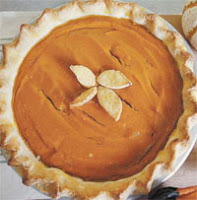 So, I know he is a happy camper this time of year as you can't seem to find anything but crisp and tart deliciousness. 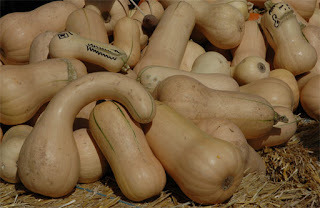 Squash and pumpkins are also exploding out the bins at the grocery shops and are hard to walk past without some consideration. Apart from carving the standard orange pumpkin every year, I haven't been too adventurous with these hard-shelled wonders. Saute the onion with the coconut oil over medium heat for about five minutes, until it is softened. Add the squash and apple and saute for two more minutes. Stir in the remaining ingredients and simmer, uncovered, stirring occasionally, for about 20 to 30 minutes, until the squash and apple are very tender (it will take less if your squash and apples cubes are small). Puree the soup with your immersion blender and that's it... enjoy! You are so adventurous with food. I admire that. I took some of your advice today and made "sweet potato fries" It was my first sweet potato experience and I have mixed emotions. I also bought some couscous, which i love but have never made. I hope all is well and hopefully see you again soon! 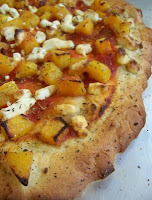 Thanks for sharing your receipe for Curried Butternut Squash and Apple Soup. My wife and I were saying to one another, this past weekend, that it would be great to have butternut squash soup again!